Blogging and designing are two totally different things and sweet thing is that mostly designers are not bloggers, but bloggers are always designers. Bloggers do a lot of designing to their blogs without anyone's help, which is certainly a good thing. But bad thing is that while they do this, they make a lot of horrible mistakes which will let to the failure of the blog. 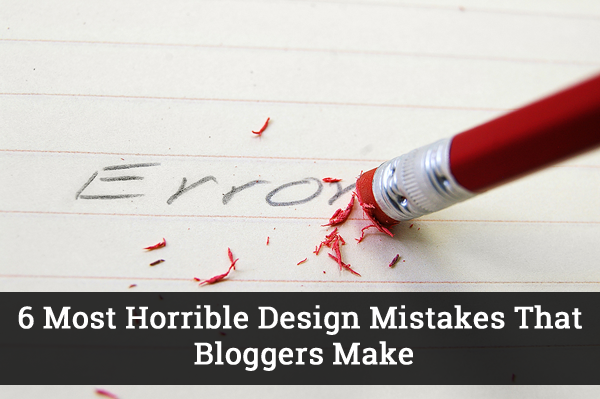 Now you must be thinking about your blog and questioning your designing ability and your creativity so without further I do, here are some horrible design mistakes that bloggers make no matter knowingly or unknowingly. Without a shadow of doubt, font is the most important thing by designing point of view because font is something that readers have to constantly look at and keep looking. Selecting bad fonts make your blog look horrible. Bad fonts include extra large or extra small size font, too much stylish font that is hard to read and too bold fonts etc. For most of niches, simple white background works just fine. But some bloggers try to go over the limit and put some color or even picture as blog background. This mostly annoys the readers because it splits their mind into looking at many things at the same time and readers feel pain in their heads and eyes after staying at such blogs for few minutes only. Logo represents you a lot more than you think. Writing the name of your blog in style with combination is not all what a logo needs. Logo needs to be relative to your blog's niche. For example, if you are a news blogger, keep your logo's color light while bloggers in gaming niche should make that same logo's color as strong as possible. Remember: Logo is your identity and the important thing in your blog. Spend some time in designing a cool logo or else hire someone to design it for you. It is suggested that you use more than one font at your blog so it looks as much professional as it can be. Now the crucial point is selection of fonts. This is because those two fonts should not only be different from each other, but they should also look professional and handy when placed together. I see countless bloggers who don't understand this thing and make horrible combination of fonts which really kills a blog's design. Images play a vital role in making any article more interesting and appealing in first look than it actually is. But in order to get most out of images, you need to focus on their quality and not size. Better quality will make things better and not higher or lower resolution. So avoid using extra large images and save yourself, your blog and your readers from getting in trouble. Also, don't copy any other blogs images instead create your own or find some royalty free images from images sites like Depositphotos. Bigger image size can also slow down your hosting like Godaddy that's why we recommend to try Godaddy alternatives. Font color is something that is mostly set default, but some bloggers take it to the next level and change the colors of their H1 or H2 headings and that's exactly where they mostly kill everything. The best thing that you can do is to let the theme the way it is, but in case you really want to change, ask an expert for suggestions. Make sure to avoid such mistakes, they can kill your blog reputation and thus losing your visitors when you promote your blog. Did I missed any mistake that most bloggers are making with their blog design? Do let me know in comments. Hi Chandeep. In your post you say that bad font is the mistake from blogger. And do you have a suggest for blogger what type of font that must use? Informative post thanks. I am using segoe ui. Yeah, it's a nice font but does it supports blogspot blog?? In my opinion, verdana is best. Thanks for this post. Yes i like standard fonts for screen too, like Verdana, Tahoma and Trebuchet. Arial can work too. Also think Georgia is better then Times New Roman if you like that style. yeah, Georgia is better than Times New Roman and one of my favorite fonts. Hi, Admin kia aaap meri ek help karen gen, merey blogger ka template ka issue hey. greatt post, can i know what fonts u use. Thanks, I use two fonts in my blog. Hi,I need your help.Why this "Template images by konradlew. Powered by Blogger." is coming while putting Copyright attribution in my blog?This is my blog http://berojgaarikizindagee.blogspot.in/ .How to fix this error.Please help me.Thanks in advance.